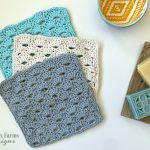 Like any dish cloths, the Donut Dish Cloth works up pretty quickly, so you’re going to want to make a several of these! 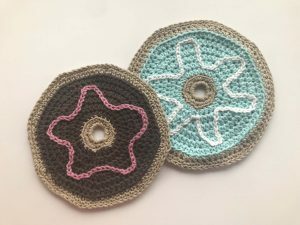 The simple repeats in the Donut Dish Cloth crochet pattern make it an excellent Netflix and Crochet project! 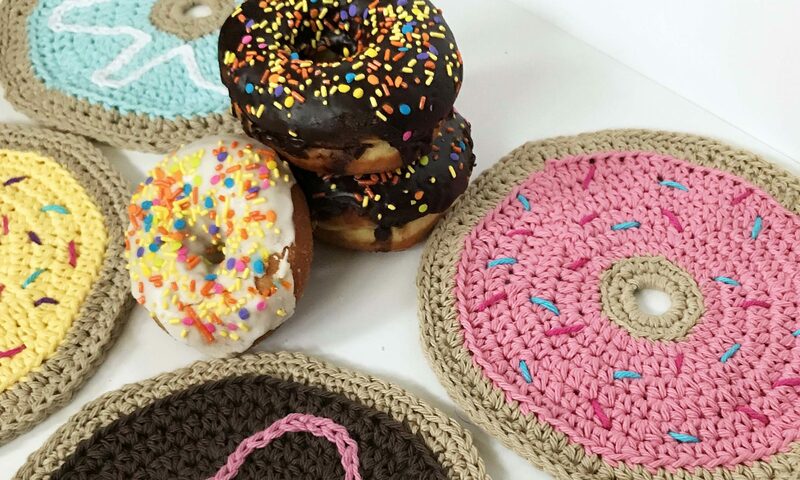 A Donut Dish Cloth Set would make a great gift as well, just pair with a favorite soap or better yet a donut! Perfect Teacher gift, house warming gift for new neighbors, or a unique Baby Shower Gift! Don’t crochet? 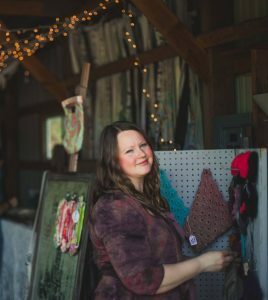 Send me a message through my Contact Page or through my Etsy shop here! 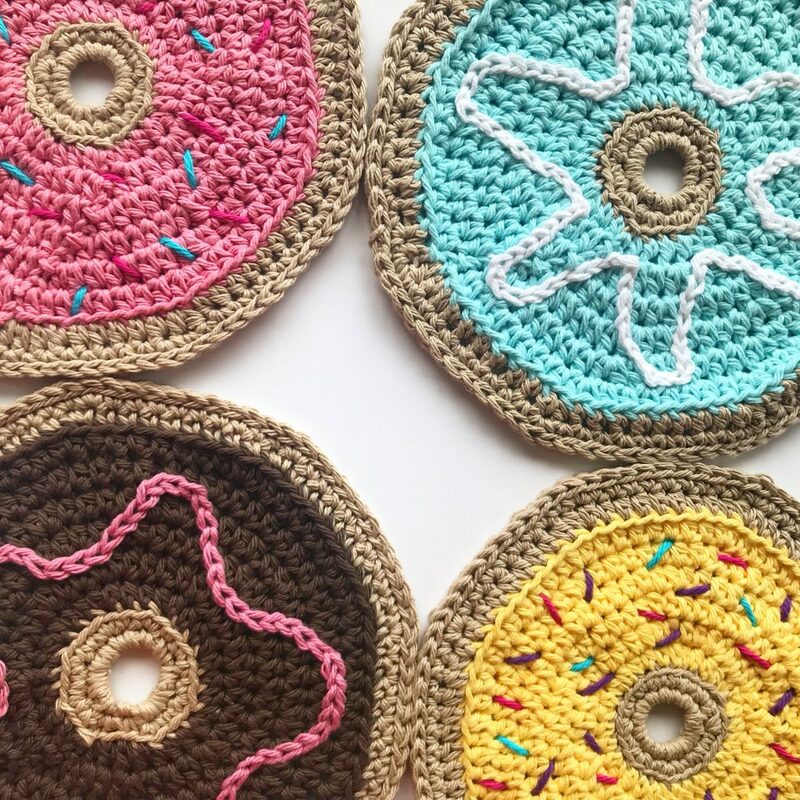 I would love to create a set of Donut Dish Cloths just for you! 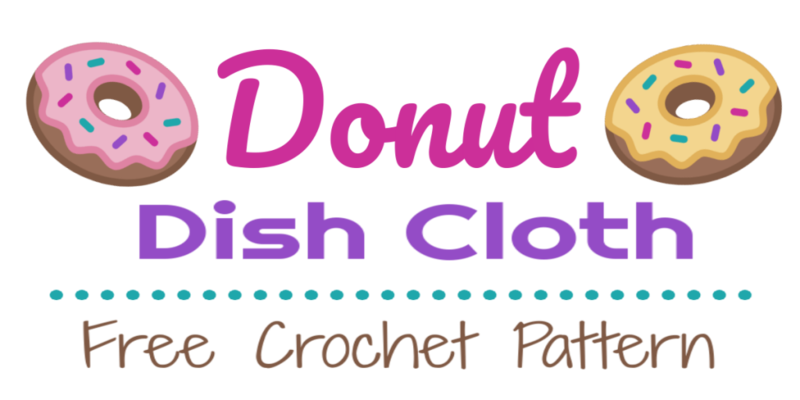 of the Donut Dish Cloth Pattern directly! G 4.0 mm hook for Icing Drizzle ONLY! Read through the entire pattern before beginning to familiarize yourself with the steps. Beginning Chain (ch) of each round counts as first stitch only where indicated. Repeat pattern directions between * and * the number of times indicated for each round. Finished size should be approximately 8.5″ across. Begin with Tan yarn and ch 10. Round 1: Join ch 1o into a ring with an sc in 1st ch, 15 more sc in ring, sl st to join, (16 sc). Round 2: Ch 1, * 2 sc, sc, * 8 times, sl st to join, (24 sc). FO Tan yarn and attach Pink yarn in same st. Round 3: Work in BLO this round, ch 2 (counts as 1st hdc here and throughout), hdc in next 3 sts, * 2 hdc, hdc in next 2 sts, * 7 times, sl st in top st of beg ch to join, (32 hdc). Round 4: Ch 2, hdc in next 4 sts, * 2 hdc, hdc in next 3 sts, * 7 times, sl st in top st of beg ch to join, (40 hdc). Round 5: Ch 2, hdc in next 5 sts, * 2 hdc, hdc in next 4 sts, * 7 times, sl st in top st of beg ch to join, (48 hdc). Round 6: Ch 2, hdc in next 6 sts, * 2 hdc, hdc in next 5 sts, * 7 times, sl st in top st of beg ch to join, (56 hdc). Round 7: Ch 2, hdc in next 7 sts, * 2 hdc, hdc in next 6 sts, * 7 times, sl st in top st of beg ch to join, (64 hdc). Round 8: Ch 2, hdc in next 8 sts, * 2 hdc, hdc in next 7 sts, * 7 times, sl st in top st of beg ch to join, (72 hdc). FO Pink yarn and attach Tan yarn in same st. Round 9: Work in BLO this round, ch 1 (does not count as st), * 2 sc, sc in next 8 sts, * 8 times, sl st to join, (80 sc). Round 10: Ch 1, * 2 sc, sc in next 9 sts, * 8 times, sl st to join, (88 hdc). Round 11: Do not ch 1, sl st in each st around, sl st to join, (88 sl st). FO, weave in ends. Select your colors for the sprinkles – I recommend using 1-3 colors. You will just need scraps to complete the sprinkles. 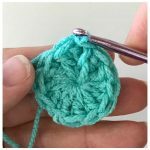 Using your yarn needle, bring yarn through from the bottom to the top of the donut, and then create a “sprinkle” stitch about 2-3 st in length and pull yarn back through. Make as many sprinkles as you like, in alternating directions and random positions. In my example I have used 2 colors and made 12-14 sprinkles in each color. Tie the ends of each color together in a double knot. Carefully secure yarn threads by weaving in the ends on the back side of the donut. The back side will not be as nice looking as the front. 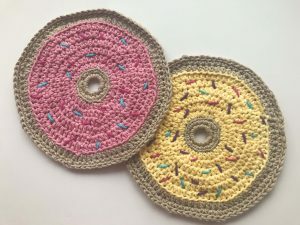 I don’t mind this, but if you do, you can opt to make 2 Donut Dish Cloths and slip stitch them together at R11 after embellishing if you prefer. 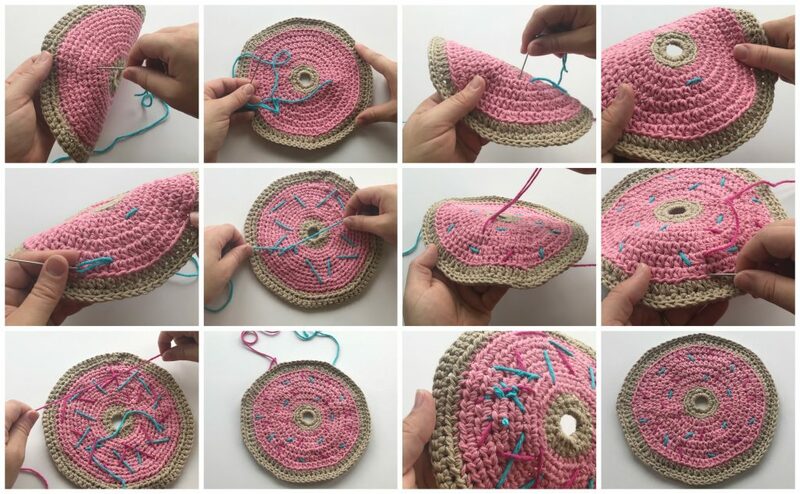 You will need a length of pink yarn about 1 yard or less to complete the icing drizzle. 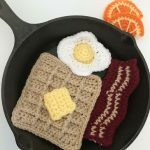 The icing drizzle is created using surface crochet slip stitches. Using your G 4.0 mm hook, and working in between the donut stitches between R4-7, insert the hook from the front to the back of the donut, and pull up a loop from the bottom to the top of the donut. Insert hook through the donut again, in the next st clockwise. Pull up another loop, pulling it through the previous loop to create a sl st. Repeat this process all of the way around, working your sts up and down between each st, between R4-7 to create a drizzled icing look. I went back and restitched this section several times until I was happy with the look I achieved. Stop when the final st comes back around to meet the first st of the icing drizzle. Trim the yarn end leaving a long tail and pull the end through to the top of the donut. We will now create an Invisible Join to bring the ends of the Icing Drizzle neatly together. 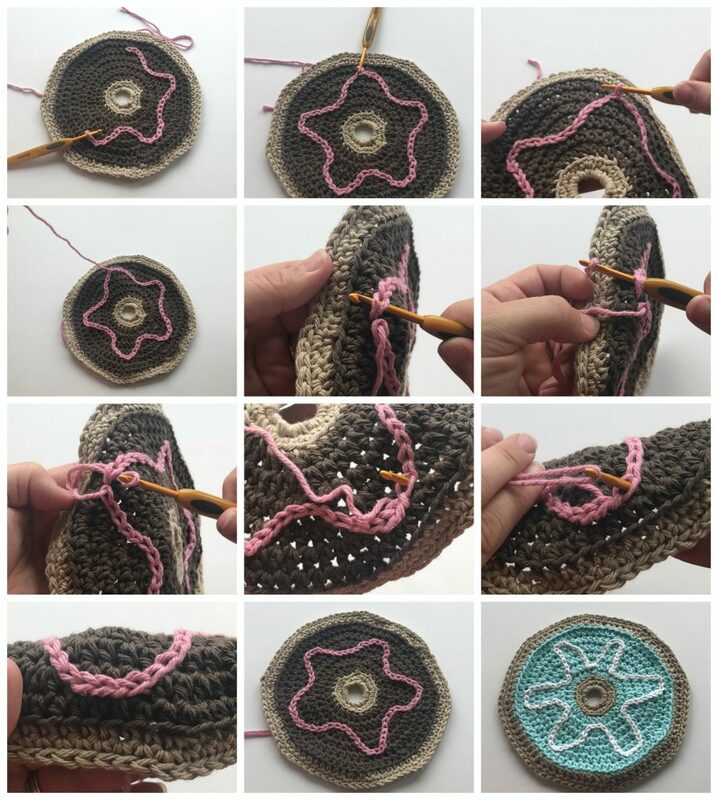 Insert your hook under the 2 loops of the first stitch created so that the tip of the hook faces the edge of the donut, yo with the final yarn end, and pull the yarn end all the way through. Now insert the hook from the bottom of the donut, in between the 2 loops of the final st created, yo with the final yarn end, and pull through to the bottom of the donut. Carefully secure yarn threads by weaving in the ends on the back side of the donut. 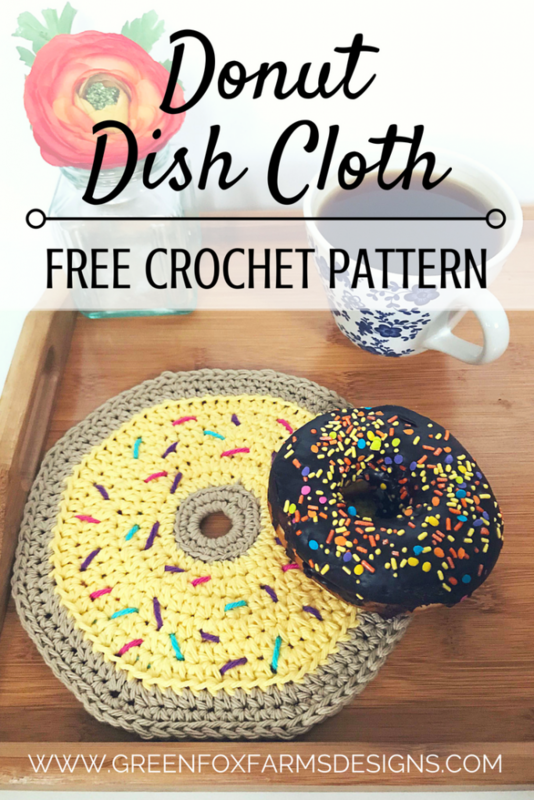 Please Share your Donut Dish Cloth! You did it! I hope you enjoyed this pattern! I am looking forward to seeing your Donut Dish Cloth! 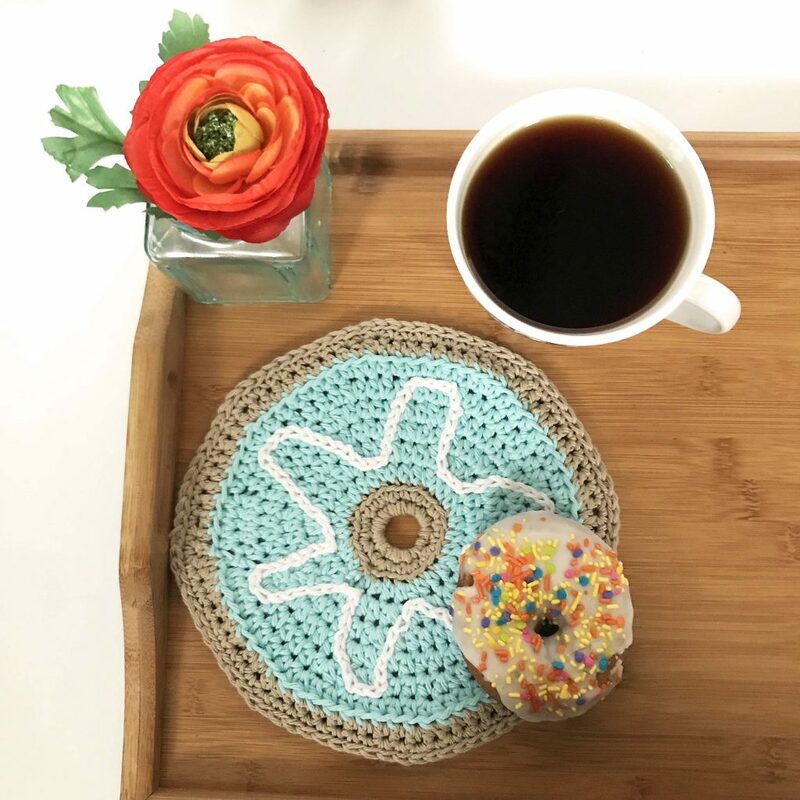 It would be fantastic if you would share your finished Donut Dish Cloth on Ravelry and social media! Don’t forget to tag me in your photos so I can see what you’ve made! 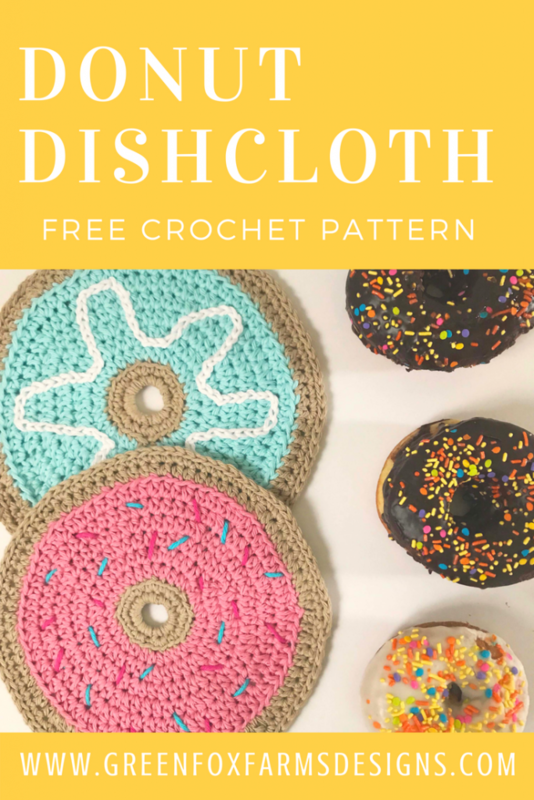 If you enjoyed the Donut Dish Cloth Free Crochet Pattern and want to help support me in offering additional Free Crochet Patterns (<– like these) in the future, please share this Blog Post with your friends and subscribe to my newsletter! You can use the social media buttons below to share this post! I appreciate your support tremendously! 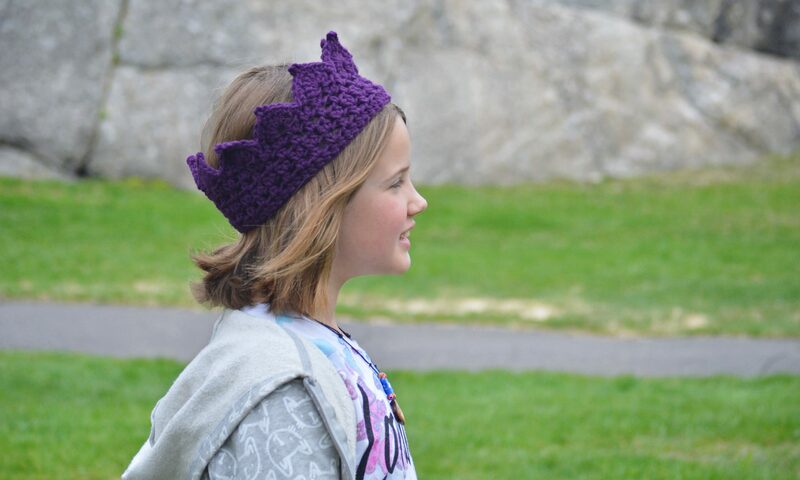 Please don’t hesitate if you have any questions or need some help with the pattern! 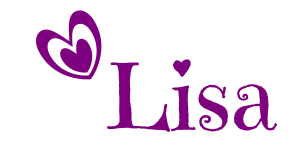 You can contact me here or leave a comment on the blog. I would love to help!